Huh? 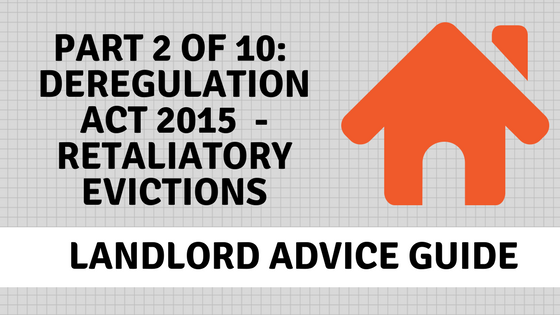 What’s the Deregulation Act 2015 & how does it affect me? To encourage landlords to keep their property in a decent condition and prevent tenants from feeling unable to complain about poor or unsafe property conditions because they fear eviction. The Act introduces new rules which came into force on 1st October 2015, affect England only. The new rules are designed to stop landlords serve Section 21 notices (basically an eviction notice), simply because a tenant made a legitimate complaint about the condition of the property. Do the changes affect all tenancies? and also fixed term replacement tenancies created after 1 October 2015. The provisions do not apply where a periodic tenancy arises after 1 October 2015, on the coming to an end of a fixed term tenancy which was entered into before 1 October 2015. IMPORTANT NOTE: From October 2018 (three years after the new rules came into force) they will apply to all tenancies, regardless of when they began. For more help please call us on 0116 222 7575.